17-21, Jalan Bukit Bintang, Kuala Lumpur. Business hours: 6.30am to 10.00pm. SAMPLE a taste of what Malaysia has to offer with The Royale Bintang?s nine menu promotion this Ramadan. 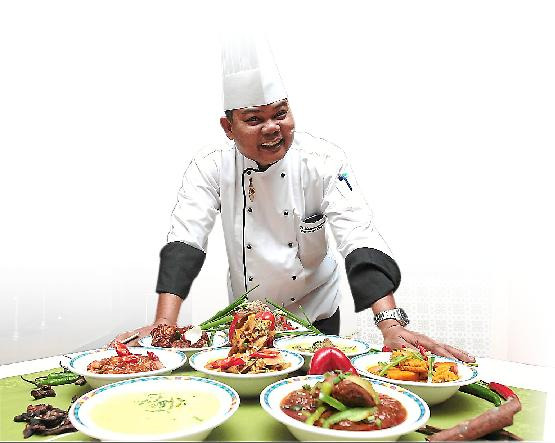 The hotel?s restaurant, Sunflowers Brasserie, is providing guests with a spread revolving around the theme of ?7 Belanga?, which showcases traditional Malay food from various parts of Malaysia. Headed by executive chef Raja Kamaroszaman Raja Zainal, the ?7 Belanga? comprises Pucuk Paku Masak Merah, Sambal Udang Petai, Gulai Sotong Nenas, Ekor Masak Merah, Ekor Sup Rempah, Kari Kepala Ikan and Ayam Goreng Rempah. Raja Kamaroszaman chose traditional dishes that were popular with locals for the spread, while at the same time tweaking ingredients for these recipes, such as the Ekor Masak Merah, which is usually cooked with chicken and not fish tail, as one would assume. ?I wanted to create unique dishes without jeopardising their taste and flavour,? said Raja Kamaros-zaman. ?The buffet will feature traditional Malay food, in addition to Indian, Chinese and western selections,? he added. Diners can tease their taste buds with some appetisers, including acar buah, acar rampai, acar limau, kerabu mangga, kerabu anika laut, kerabu terung, cucur udang, Begedel Mussel, tauhu sumbat, lemang, ketupat nasi, ketupat palas dengan kuah kacang, among others. Main courses including the Briyani Rice with Lamb will leave patrons wanting more. Other favourites on the menu include ikan bakar, murtabak, kambing panggang, fresh grilled beef, chicken satay, among others. Chinese dishes such as Fried Butter Prawns and Nyonya Assam Style Steam Fish will be on the menu, while durian lovers will enjoy the hotel?s bubur durian, which is aromatic and rich in flavour. Those preferring conventional desserts can enjoy the buffet?s selection of traditional kuih and sweet treats including chocolate bread pudding, dates, ?hot? tau foo fah, apam gula hangus, assorted jelly and pudding in glasses and French pastries. The hotel?s range of cakes including tiramisu, Blueberry Layer Cake, swiss roll, banana cake and more. The buffet is held until Aug 8 from 6.30pm to 10pm. Rates are RM75++ per person for adults and RM37++ for children between six and 12 years old, and senior citizens.